Explore with its 8 unique geographical regions and diverse natural beauty, from soaring mountain peaks of the Southern Alps, fiords, glaciers, lakes, mighty rivers, native alpine bush and the southern skifields of New Zealand's South Island - by bus and coach from Christchurch by clicking on the destination you would like to travel too on the left or on the route map located on the right..
With the regional and national bus and coach travel networks of Atomic Shuttles, Naked Bus, InterCity Coachlines, Newmans Coachlines and Great Sights operating over 80 daily services, you can travel to over 300 cities, towns, skifields and major tourist destinations and attractions in the South Island. InterCity Coachlines operates a fleet of modern, eco-friendly air conditioned buses and coaches with reclining seats with head and foot rests. InterCity buses do not have onboard toilet/washroom facilities but do stop regularly for comfort and refreshments on route. Great Sights operates scenic coach and premier sightseeing services using a fleet of modern eco-friendly air conditioned coaches that have reclining seats with foot and head rests and onboard toilet/washroom facilities. InterCity Coachlines operates the Starlighter overnight coach services between Wellington, Palmerston North, Taupo, Rotoura, Hamilton and Auckland, connecting with Cook Strait ferry services operating between Picton in the South Island and Wellington in the North Island. The Starlighter service features reclining seats with foot and head rests, individual reading lights and air conditioning controls, onboard toilet/washroom facility and makes two refreshment/comfort stops on route. The Starlighter overnight bus/coach services have the GOLD seats - soft leather reclining seats with head and foot rests complete with individual USB charging ports located on the lower deck for stress free travel. These seats provide plenty of room to stretch your legs, lie back and relax and log onto the onboard wifi. The best thing is, these seats don't cost a lot more than the regular fare! 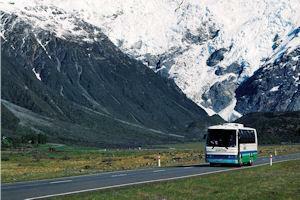 There is combined train and scenic bus travel and fares, the includes travel on the famous TranzAlpine train, from Christchurch to Nelson, Punakaiki, Westport, Hokitika, Franz Josef, Fox Glacier and Queenstown. 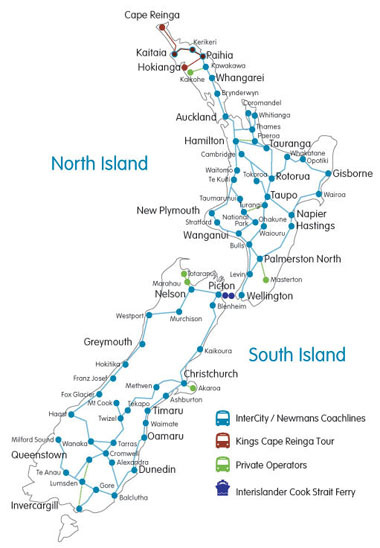 You can travel from Christchurch to Wellington, Taupo, Rotorua, Hamilton, Whangarei, Paihia/Bay of Islands, Kerikeri and Kaitaia using combined bus and ferry travel, that includes both bus and ferry travel in one fare and ticket. You can make reservations from Christchurch International Airport for services to and from Christchurch to Queenstown, Mt Cook, Dunedin, Invercargill, Te Anau or Wanaka. If you want to explore and see New Zealand's scenic beauty - there is a range of 'Book As You Go' flexi bus and ferry passes offering value for money travel. If you have any questions, would like one of our travel consultant's to make a reservation for you or if we can be of any assistance in planning your travel, please do not hesitate to contact our Travel Centre team.